Added on 4/29: Here is a link to an Andrew Revkin article in the New York Times with excellent information about why Max Wyss thinks that the death toll could reach 57,700, and the range of uncertainty. Map added on 4/26 at bottom showing avalanche problems on Mount Everest. A strong earthquake occurred in Nepal about 14 hours ago, and as I write this the death toll from the earthquake has risen to 1,457, with more deaths expected. The people face a cold night without shelter, water or electricity in many regions. The world's thoughts are focused on the people of Nepal with hopes that rescue efforts proceed smoothly an rapidly. According to the USGS, large earthquakes in this region have been relatively rare with only four events of M6 or larger known to have occurred within 250 km of this earthquake site. Two of these were a M6.9 earthquake in 1988, that caused about 1500 casualties and a M8.0 event in 1934 at roughly the same location of this 1988 event that severely damaged Katmandu and caused around 10,600 casualties. The earthquake struck near noon local time (11:56 a.m.), 11:11 p.m. the previous day, west coast time in the U.S. A magnitude 6.6 aftershock occurred about a half hour later, and strong aftershocks continue. 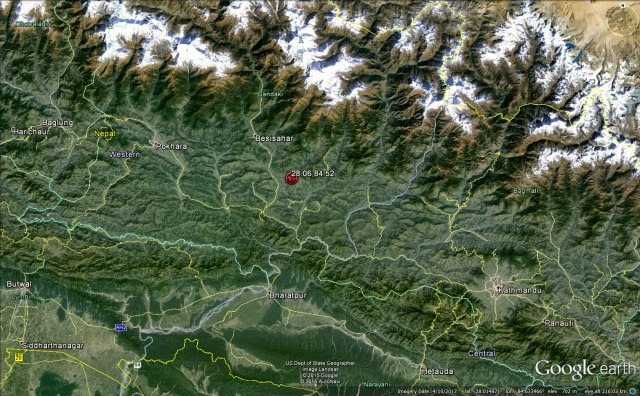 It was centered less than 50 miles west of Katmandu, with aftershocks surrounding the capital on the north and east (see map). Katmandu sits in a valley of 1,000,000 people. There are reports that roads buckled in Tibet, and that avalanches were triggered on Mount Everest. The magnitude of the earthquake has been reported from M7.5-M7.9, and the epicenter at 7-12 km. These estimates should get better as seismologists have time to refine the models and analyze the data, but it is clear that the quake was quite shallow. The Indian and Eurasian plates are converging at a rate of 45 mm/year, one of the fastest rates on the planet. This motion drives the uplift of the Himalayas. India is thrust under Eurasia, and the motion between the two plates makes this one of the seismically most hazardous regions in the world. The surface expression of the fault (along the red line in the figure below) in the vicinity of Nepal is marked by the east-west trending Himalaya Front in the north of India and Nepal sits within this belt. To the north is the high Plateau of Tibet. An excellent detailed summary of the regional tectonic setting is available on the USGS events page reporting the current earthquake found here. A 2004 thesis by Bierendra Kumar Piya concluded that there was a significant potential for liquefaction in the Katmandu valley in the case of a strong earthquake. He noted that liquefaction occurred in parts of the valley in the 1934 earthquake, which this one closely resembles, so we expect to see reports of damage to buildings and infrastructure due to liquefaction. There is also a strong possibility of landslides. Dave's Landslide Blog at AGU (starting on April 25, 2015) will be updating and discussing the landslides. News is trickling in that devastating avalanches have killed approximately 20 people on Mount Everest. Sadly, the best time to climb Mount Everest from a weather perspective is now, April and May. Sadly, on April 18, 2014, thirteen people were killed in an avalanche, at a site well known for its danger. There is a dangerous ice fall, known as the Khumbu Icefall, where seracs (unstable blocks of ice separated by cracks in an ice field) loom large over the route. Climbers usually try to pass quickly through here in the early morning before rising day temperatures amplify the hazard. According to Wiki, citing Russell Brice who runs a guide company called Himalayan Experience, ice falling from the serac narrowly missed climbers in 2012, and according to another mountaineer/writer, Jon Krakauer, the 2014 avalanche was triggered when a large block of ice broke off from the bulge. The Khumbu Icefall and the location of the 2014 avalanche are shown on the adjacent figure. It will be very interesting to see if the present large avalanche originated at the same site, but travelled much further all the way down the ice fall to cause so much damage in the Base Camp. Remember that Nepal is landlocked. Tom Robinson of the University of Canterbury has done a preliminary analysis of the roads likely to be affected by landslides; that analysis is available on Dave's Landslide Blog here. The rescue situation w is dreadfully complicated with the airport closed and most access roads damaged by landslides. (Correction: The airport is open and India and China are flying in relief.) The monsoons are less than two months away, and since it is likely that many rivers are blocked by landslides, air and satellite photography of the landslide settings is essential to analyze future flooding due to blocked rivers. Just because I moved out of the Midwest doesn't mean that I have lost my interest in tornadoes! So, to my friends in Illinois, I'm still thinking of you!! Forty one years ago there was a "super outbreak" of 147 tornadoes through Illinois, Indiana, Kentucky, Tennessee, Alabama, Georgia, and surrounding states. All told, there were 147 tornadoes recorded on April 3-4, 1974. This was exceeded only on April 26-28, 2011 when 293 tornadoes were recorded. 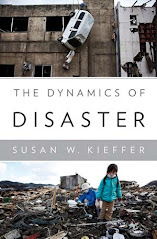 Joplin, Missouri, was destroyed (more information on this is available in Chapter 8 of my book, The Dynamics of Disaster, shown in the left sidebar). Now, meteorologists are warning of a severe weather outbreak, including tornados, for the midwest next week. What do meteorologists look for to predict a tornado outburst days or even a week into the future? First, they look for the jet stream to plunge to the south, bringing strong winds westerly or southwesterly winds and cold air aloft. Second, they look for warm and humid air flowing up from the Gulf of Mexico at lower levels, pushed by southerly winds. Being less dense than the cold dry air, the warm humid air is unstable. The required four ingredients are: warm air, cold air, moisture and winds. Low-level winds blowing with different strength at different elevations set up shearing that produces a horizontal spinning vortex, and regions where winds rise, producing updrafts, draw air flowing along the surface and its vortices in and up. A third layer of air, hot and dry, develops between the lower warm moist air and the colder upper air. This layer acts as a cap that prevents the warm moist air from rising, allowing it to warm even further, creating a positive feedback that makes the instability even greater. As the system moves from west to east across the U.S., the lift increases, the capping dry air is removed and explosive thunderstorms can develop. The winds circulating around a low pressure center provide a mechanisms that can spin up a normal thunderstorm into a huge rotating vortex known as a "supercell." Supercells contain strong, rotating updrafts. Because they are so big, they are usually isolated from other thunderstorms in the area, sucking up energy and moisture from miles around. Tornados seem to develop within a supercell several thousand feet above the ground. Tornados begin in the supercell as a rotating, funnel-shaped cloud extending from the base of the supercell. When the funnel cloud is half-way between the cloud base and the ground, it formally becomes a "tornado." BTW, last night was a short total lunar eclipse, and here's a link to a time-lapse of it from USAToday.